Dr. Zac Labby, assistant professor in the Department of Human Oncology, demonstrates placement of a plastic face mask used for frameless stereotactic radiosurgery, a procedure used to treat small primary brain tumors, brain metastases and other intracranial conditions. 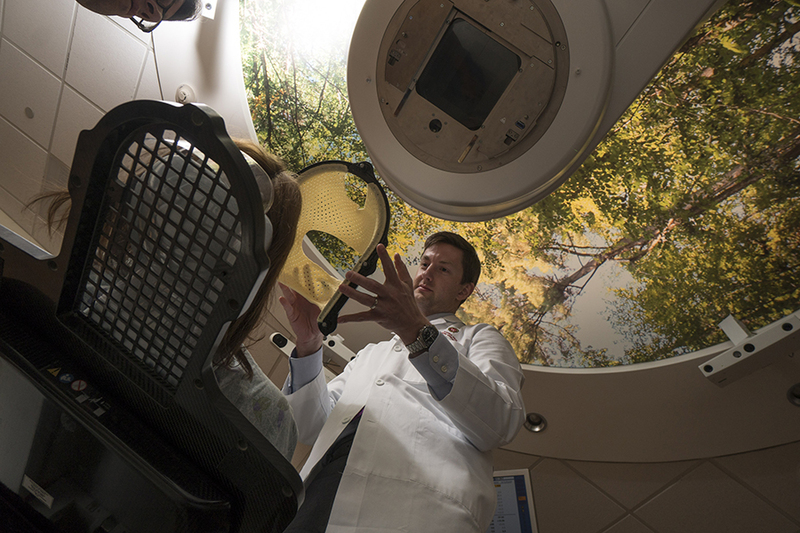 The Radiation Oncology Clinic at University of Wisconsin Hospital recently implemented a new method of performing stereotactic radiosurgery (SRS)—a single high dose of radiation to precisely treat small primary or metastatic brain tumors and other intracranial conditions. Until recently, patients receiving SRS at University Hospital would have a head frame attached to their skull and subsequently fastened to the treatment table. This kept the patient’s head perfectly still during imaging and treatment. While this technique provided the necessary sub-millimeter precision, having the frame attached, wearing it for the better part of a day and having it removed could be uncomfortable, inconvenient and stressful for patients. Now, with the use of a custom-fitted, plastic mask combined with surface monitoring and a radiation therapy machine specifically designed to conform to small targets, clinicians can deliver the same treatment without the immobilization frame. This improves the patient experience by eliminating the discomfort, follow-up care and risk of complications associated with having the frame surgically attached and removed. It also reduces treatment time. With the frame-based system, simulation, treatment planning and treatment needed to take place on the same day. As a result, patients would be in the hospital with the frame attached as they waited for radiation oncology staff to create the final treatment plan. With the frameless system, simulation, planning and treatment occur on different days. This reduces the time constraints on treatment planning, which enables treatment of more complex cases (multiple metastases) that might otherwise require whole brain radiation, a procedure that may have greater side effects than SRS. Labby predicts the frameless SRS program will also have a “significant impact” on pediatric patients. In order for young children to tolerate having a head frame in place, they would often need lengthy general anesthesia, which is stressful and expensive. Children are more likely to tolerate SRS wearing a mask. If they do struggle with the mask they can be given conscious sedation, which is less onerous than the full sedation often required with the frame-based system. Like other types of radiotherapy, SRS works by damaging the DNA of targeted cells, which causes them to lose the ability to reproduce. The major difference between standard radiotherapy and SRS is the dose. SRS uses a single high dose of radiation rather than a fractionated dose administered over multiple sessions. Because of the high dose, precision is especially important. A patient is immobilized with a plastic face mask in demonstration of frameless stereotactic radiosurgery, a procedure the Radiation Oncology Clinic at University of Wisconsin Hospital uses to treat small primary brain tumors, brain metastases and other intracranial conditions. The frameless system is the latest improvement for patients who undergo SRS. In 2016, the clinic began using its new Varian TrueBeam STx. 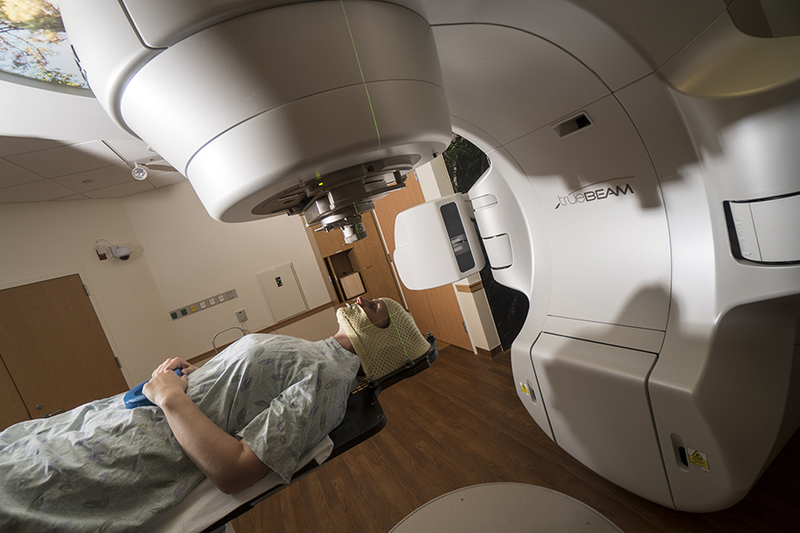 Designed to treat small targets, this radiation treatment machine features a high-definition collimator to deliver radiation beams that conform to the shape of the tumor. The previous treatment system delivered dose profiles that were more or less spherical. Treatment of non-spherical tumors entailed delivery of multiple spherical distributions, or isocenters, each requiring its own plan, set up and delivery. Now, instead of delivering treatment one sphere at a time, the entire tumor can be treated with just one set up, which reduces treatment time. Before treatment, a mask is made that precisely conforms to the size and shape of the patient’s face. The mask attaches to the treatment table to immobilize the head. During this visit, the patient gets a CT scan that uses an intravenous contrast agent to provide high-quality images for use in the treatment planning process. On the day of treatment, the patient is again immobilized with the mask for a second CT to verify alignment—one of many quality assurance measures. To ensure the same level of precision as with the head frame, the mask has cutouts that expose the patient’s nose and brow to provide reference points for a patient position monitoring system. This technology, known as AlignRT, uses three ceiling-mounted cameras to create a 3D model of the patient in real time. The system continuously compares these 3D images to the optimal positioning determined during treatment planning to ensure treatment accuracy. If the target area moves out of a predetermined tolerance range during treatment, the system automatically shuts off the beam. Edward Felten has experienced both the frame-based and frameless SRS procedure for lung cancer that spread to his brain. In fall 2017, he underwent a successful frame-based SRS procedure. In summer 2018, Dr. Baschnagel found another metastasis in a different location in Felten’s brain and recommended another SRS procedure. This time he would use the newly implemented frameless SRS technique.